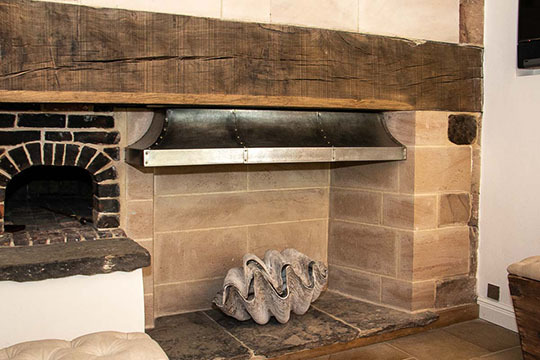 Welcome to Verdigris, a contemporary forge and metalworking studio based near Manchester. 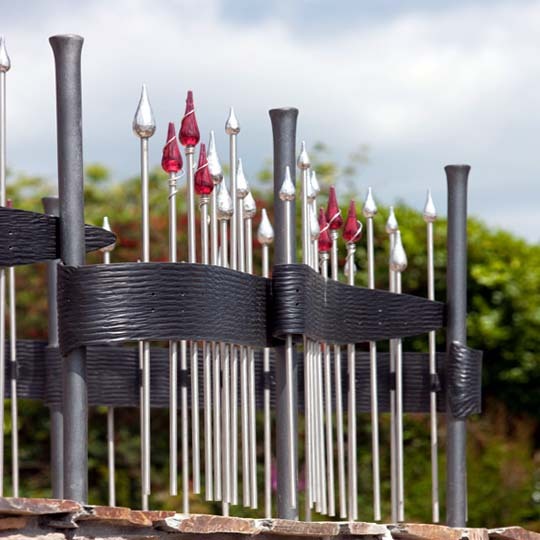 Work made by the forge is installed throughout the UK and occasionally further afield! 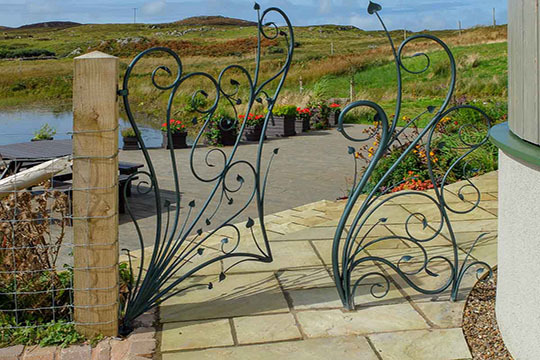 All types of creative and artistic metalwork is designed and made, ranging from pure sculpture through to more practical items such as gates, railings and balustrades. We have gained a reputation for creating exciting, innovative and highly detailed designs by blending traditional blacksmithing techniques with the use of modern precision machinery. Our passion is for forged steel and wrought iron but many other metals such as bronze, copper and stainless steel are used. You can see a selection from our portfolio of bespoke metalwork below but there is a more comprehensive body of work to view in the gallery pages. This richly detailed garden gate embodies the principles of the Arts and Crafts movement with its understated design and precise, crisp joinery. Traditional blacksmithing techniques on display include hot punched holes, elegant tapers and hand forged detailing. This design of this spectacular handmade bed was strongly influenced by the bold, sweeping and asymmetric curves of the Art Nouveau movement. Traditional blacksmithing techniques were used to create the dramatic changes in thickness of the metal and forge a contemporary interpretation of this style. 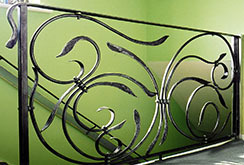 The design of these forged bronze railings was inspired by the prow of an ocean liner. They sit beside the moat of a medieval manor house in Cheshire. Since the site is a scheduled ancient monument, the terrace on which they sit is cantilevered away from the house to avoid disturbing the ground beneath. 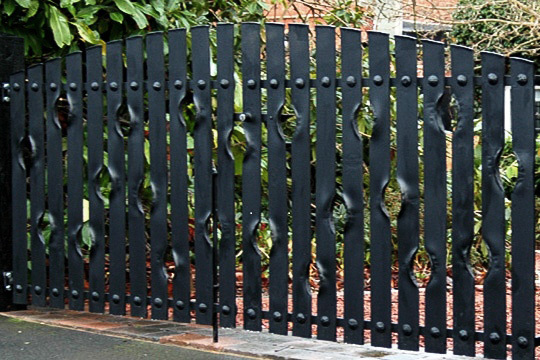 These contemporary and modern steel driveway gates were designed to be understated yet still have plenty of rich and interesting detailing. The holes in the metal were made by hammering the steel whilst hot, rather than simply cutting them out. The metal moves as it is struck creating the attractive swellings surrounding the holes. 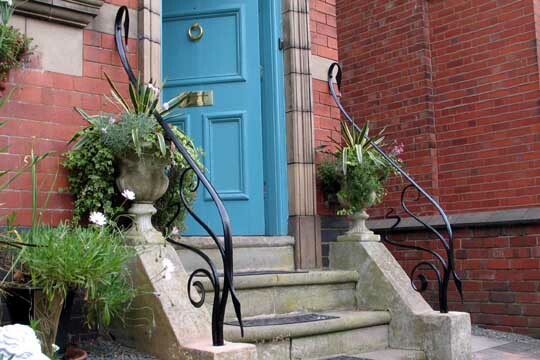 These vibrant and exuberant stair railings were commissioned by clients with a passion for gardening and nature. The railing's design was inspired by the youthful and inquisitive growth of seedlings and how their emerging tendrils and leaves appear to explore their surroundings as they rapidly grow. The design of this garden gate was strongly influenced by the principles of the Arts and Crafts movement and it's emphasis on traditional craftsmanship and simple design. It features hot punched holes, elegant tapers and hand forged leaves typical of the period. 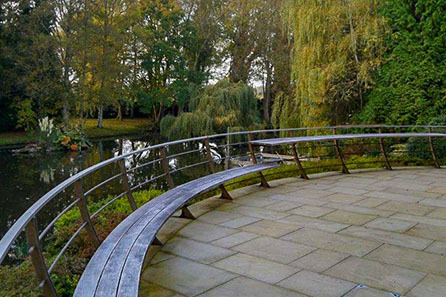 This stainless steel fire canopy was designed for Chorley Old Hall; the oldest inhabited country house in Cheshire. The canopy has a double walled construction with textured and lightly distressed stainless steel outer walls and uses a lapped and riveted construction. The character of this elegant balustrade for a bedroom balcony was designed to reflect the character of the period property. The leaves all face in slightly different directions and are hand forged making each and everyone utterly unique. The brief for the design of this gate and its side panel was to avoid any straight lines and that the meeting of the two halves should blend seamlessly into the design. The commission also had to reflect the wild beauty of its Hebridean setting. 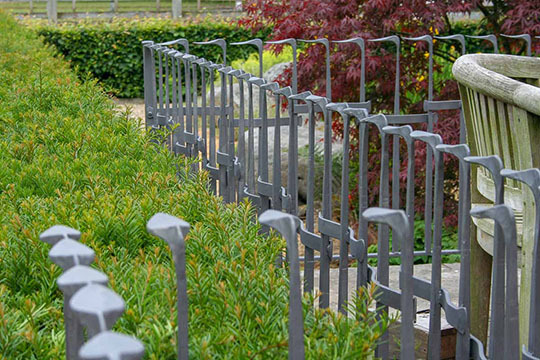 These bespoke wrought iron railings were designed to reflect the semi-circular motif used throughout the garden. 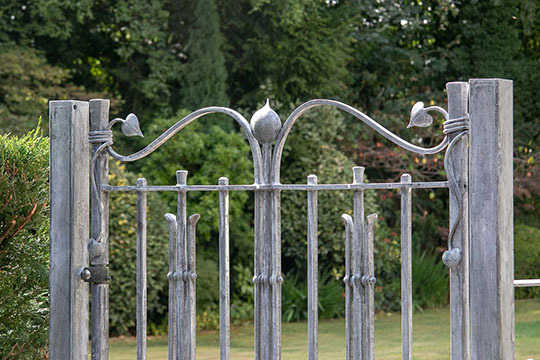 As with many of our designs, these railings don't use a conventional top rail, instead the forged steel uprights were shaped to suggest a top rail. We have an affinity towards designs using movement and flow. 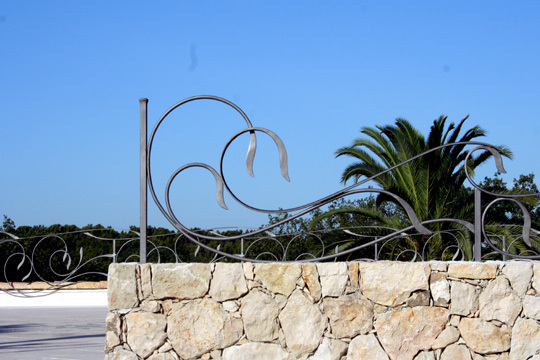 Sweeping curvilinear lines are our specialty, as these bespoke, stylish and contemporary metal railings demonstrate. They were commissioned for a villa in the French Riviera and their design uses breaking waves for its inspiration. 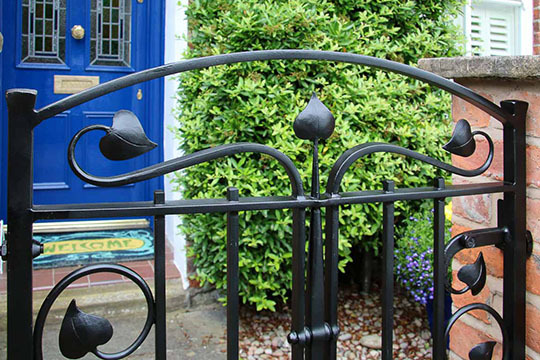 As with many of our commissions, the railings are designed without a surrounding rectangular metal frame. 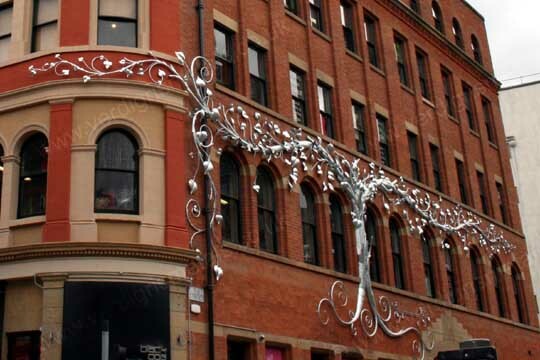 This galvanised steel tree sculpture was commissioned for the side of Affleck's Palace; a shopping arcade in Manchester with an eclectic mix of small independent stalls and boutiques aimed at the student market. The spreading growth of the tree suggests youthful and inquisitive exploration. 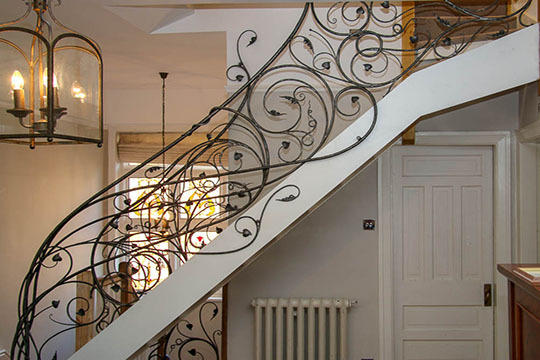 These design of these metal stair railings was inspired by the flowing and expressive lines used in metalwork from the Art Nouveau period. However, setting the curves against the lattice work of straight lines gives the design a modern twist and helps to emphasise the flow of the curves. 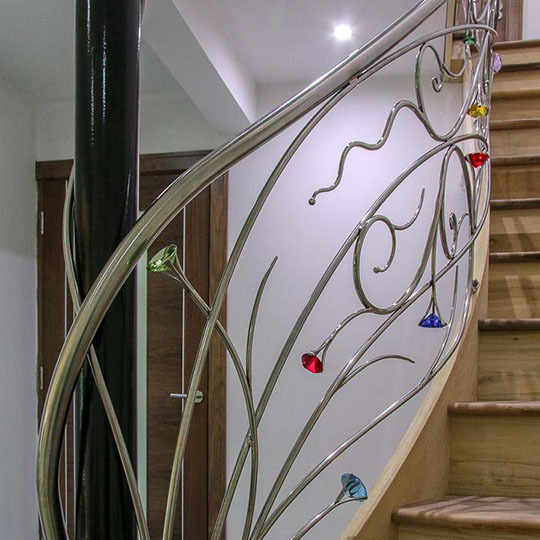 Spectacular, colourful and sparkling stair railings made from stainless steel and designed with more than just a hint of a fairy tale to them. Coloured glass diamond shaped crystals held in place with jewellery style fixings glint and gleam as they catch the light and add an almost magical fantasy quality as the railings cascade and flow up the stairs. 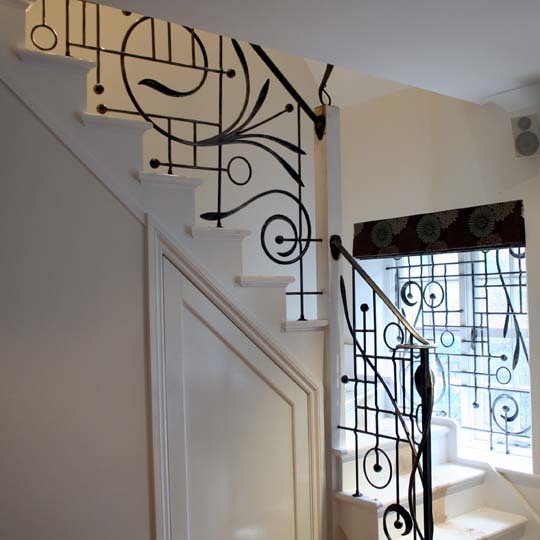 These elegant bespoke metal handrails were commissioned by customers with a passion for all things Art Nouveau. The design of the handrails reflect the period features seen throughout their house. 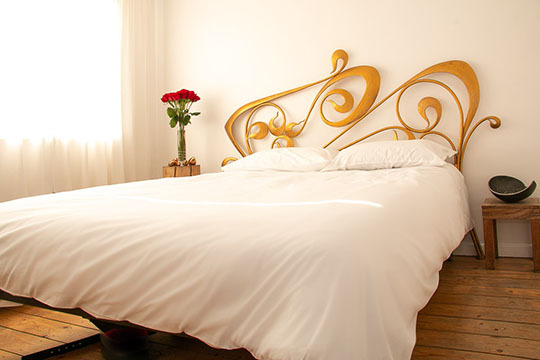 Their sweeping and flowing curves were inspired by the lines typical of Art Nouveau metalwork. The attention to detail of a jeweller was used to create this dragon by fusing and subtly blending bronze and polished stainless steel. Amethyst gem stones bring it to life as they catch the light but please click on the picture to see another of the sculpture's unique features. These very different and unusual stainless steel and glass railings were commissioned for a seafront property in St Mawes Cornwall. Their design picks up on aspects of this environment including naval pennants flying in the wind, stylised flora from the area and the dry stone wall on which they sit.